Feeding the Babe | The joys and challenges of nurturing our kids. So, no, technically this is not the true beginning of spring, but it sure felt like it here in NOVA. All the lovely weather and amped up activity schedule, made for some much later meal (and bed) times for this family. Here’s hoping we’ll get our acts together soon. 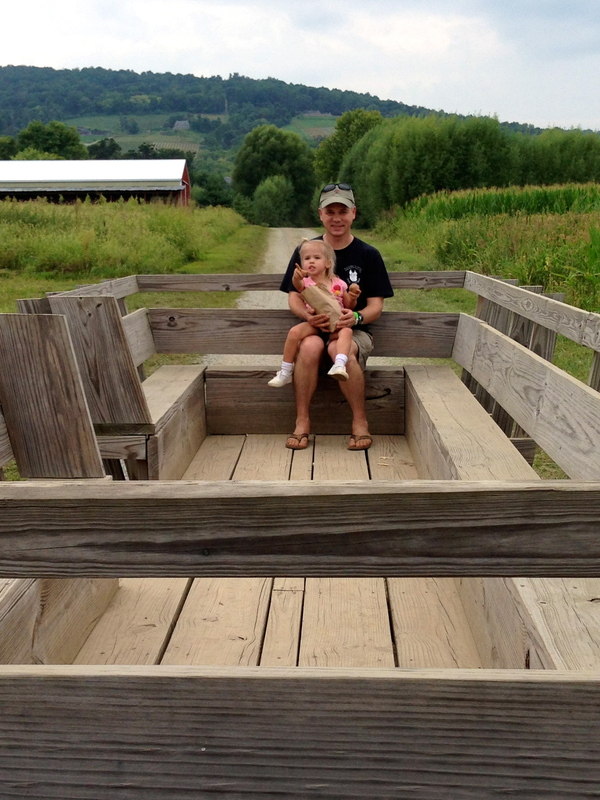 Many years ago, I created this blog to share the feeding trials of my infant daughter. She was so small in stature and it was a constant fight with pediatricians who thought she should weigh more, when I knew that she was perfectly healthy as she was. As time has passed (almost seven years! ), her size remains consistent she is happy and is in great health. 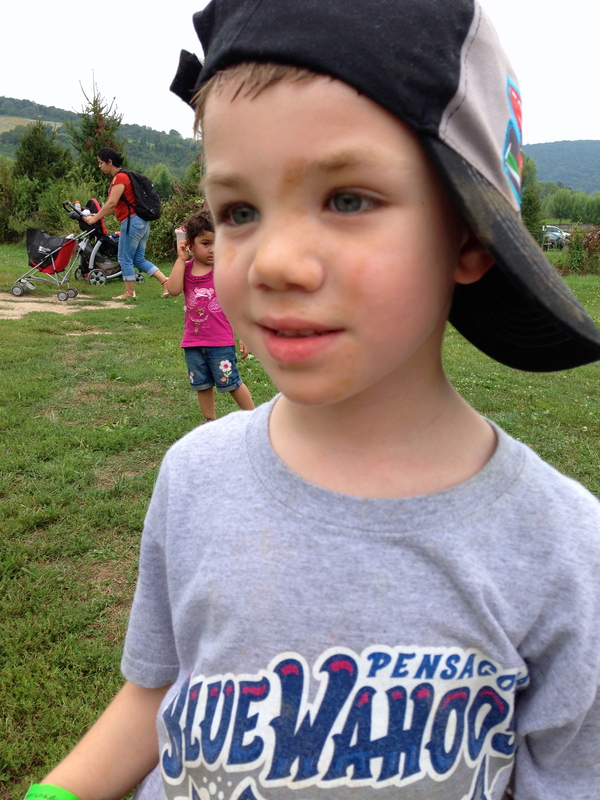 What became an even greater struggle as a parent and dietitian was my son’s picky eating. In reality, he always was very strong willed regarding his food choices and we have worked very, very diligently throughout his ten years of life, since he started solids expanding his diet beyond grains, dairy and fruits. Over the course of his toddler years he began to enjoy animal proteins and the preschool years included the expansion of his consumption (note, not enjoyment) of various vegetables. All of this took much work, pressure and persistence on my husband and I to help get him to this point. So possibly we should be proud (? ), in part we were. As he grew older and mealtime battles still continued too regularly for our tastes my patience began to wear thin. Why did he refuse foods he previously enjoyed? Why could he only eat them a certain way? Why did he need them all separated? Why was this still a challenge??!! The short answer is… we were wrong. A fellow registered dietitian, a feeding guru one might say, from a far away land called Wisconsin showed me the light. The concepts of Ellyn Satter and her feeding Institute had been introduced to me over the years, at various conferences as great resources for child feeding. Her website https://www.ellynsatterinstitute.org was the perfect starting ground for any person, parent or professional, who had questions and concerns about the feeding of children. So I began to immerse my self in her teachings, ordering every book, every guide, and let me tell you, it has been enlightening and life changing. Her most basic principle of feeding dynamics, the Satter Division of Responsibility in feeding is broken down to two basic rules. I (the parent) was responsible for when/where/what food to serve and AJ (the child) was responsible for choosing whether and how much to eat. Starting with that point, our family embarked on a new dining journey, one with less rules, less emotion and gradually less stress. It was, is and probably will continue to be a challenge for myself to not micromanage my children’s’ meals. The first couple of days were kind of rough (one meal he only ate a plateful of peas!!). Sometimes I can’t help myself and stray from the rules a little to comment how our bodies need multiple food groups, not just protein and grains. But we are growing in this together, and within a couple of weeks, it was obvious that this was a very good path for our family. After our trip to Great Country Farms earlier this month it has been potatoes, potatoes, potatoes on the menu. One of the favorites for the Babe and AJ has been these oven “fries”. This family is all about the oven fries. They think they are getting away with eating junk for dinner. I’ll admit, most of the time I cheat and buy the frozen version (LOVE the Alexia products). 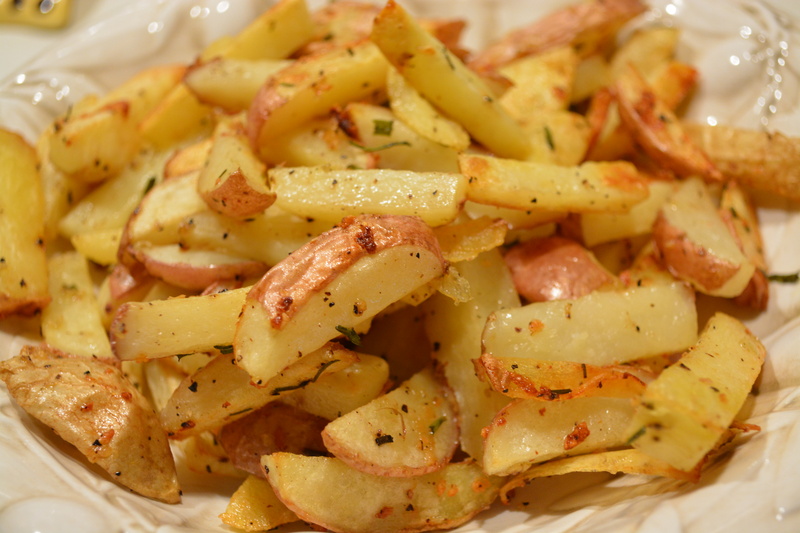 But these fries are super easy to make and they are delicious. Did you know that Americans get most of their vitamin C from potatoes? Surprised? Well we are a french fry nation. One potato (5.3oz) has 45% of your daily value for vitamin C.
Potatoes are an excellent source of Potassium (620 mg in a 5.3 oz serving) to be exact. Raw potatoes have the potential to last for months in storage. Extend their life by storing them in a cool, dry place and do not wash them until you are ready to use them. 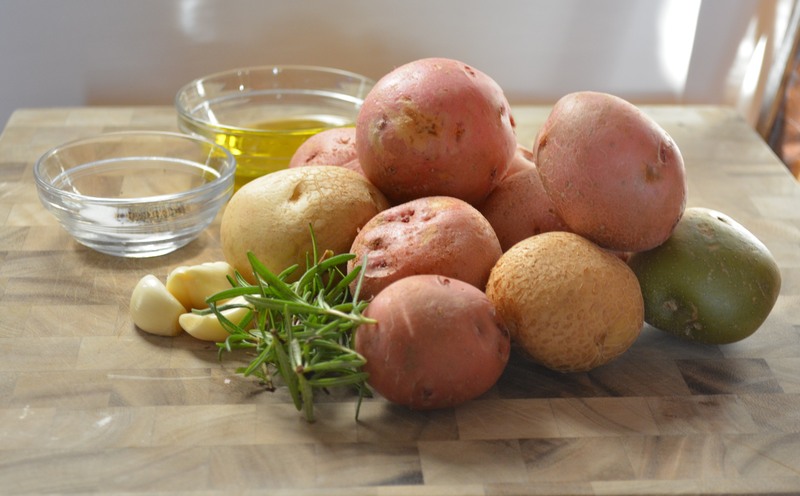 Slice potatoes (into the fry shape) then toss with the olive oil, rosemary, garlic, salt and pepper. Spread into a single layer onto a cookie sheet and bake for about 30 minutes (longer if you like them really crispy, less if you prefer them very soft). **We are getting towards the end of our potato stash so I had to use these smaller ones. Normally 4-5 large yukons or russets would have done the job. ***On a side note: I was in no way compensated by Alexia Foods for this post. Also, be patient with my food photography. I just received a new camera for my birthday and am so excited to use it for the blog. There are so many food “rules” floating around out there that I try not to aggressively restrict the family in obeying many of them. Instead, I like to make goals, better eating habits that are not necessarily limiting, but expanding on all of the healthful choices that are available. One major goal that our family has is to consume as many locally or regionally sourced foods as our budget allows. We are BIG fans of the farmers market. Virginia has been very kind to us in this arena. There are so many markets, bakeries and dairies to choose from and utilize. I am in local food heaven. This is a far cry from our home state of Florida in regards to variety and availability of truly local foods. 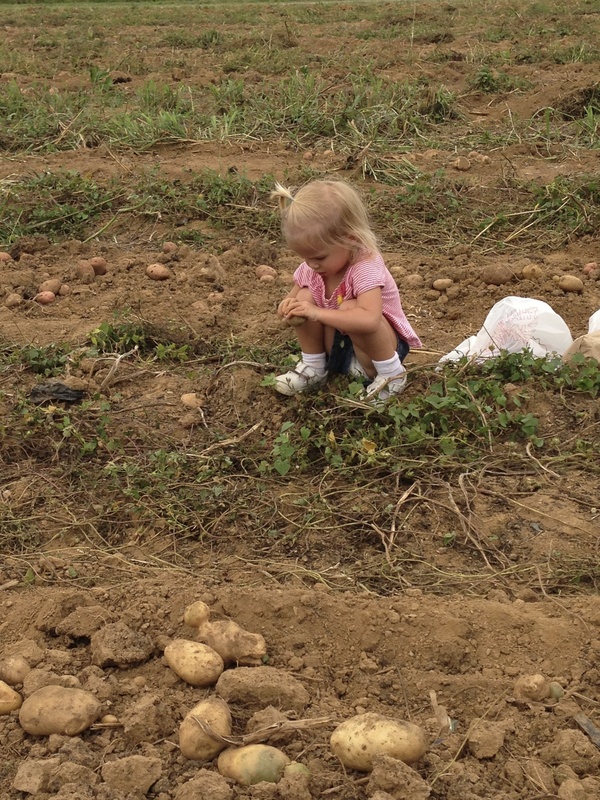 This past week we decided to pay a visit to one of the local farms for some down and dirty potato picking. 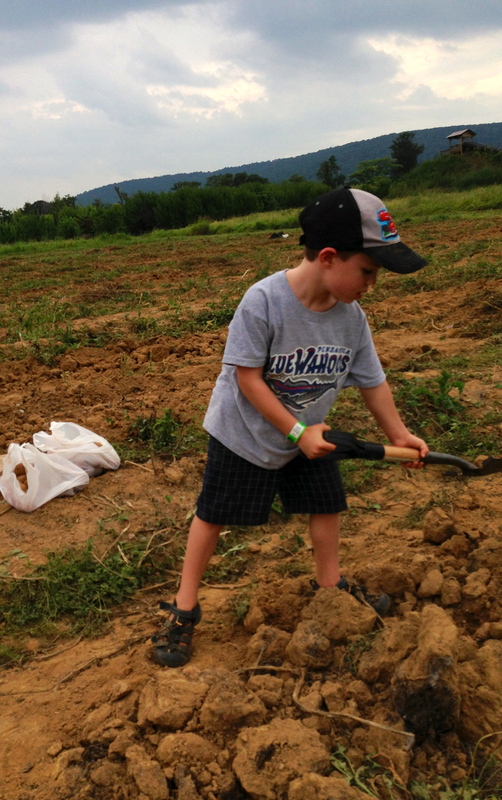 Great Country Farms in Bluemont, VA was hosting their annual Big Dig festival. The kids had a blast foraging for Yukon Golds and (what appeared to be) Idaho Reds. Tim was even able to pick some green beans in the neighboring field. The picking part was short-lived though, we had to pace ourselves otherwise we would have ended up with 50 pounds of potatoes for our little family of four. At the end of the day we had a great adventure, playing on the farm, visiting the animals and bringing home about 15 pounds of potatoes for our future dining pleasure. The kids on the hunt. AJ was so excited, he brought his own shovel. Returning from the fields, hot, happy and covered in dirt. The school year is upon us, today is AJ’s first day of school. This year is a big one for us, the Babe is beginning to go to preschool and AJ is starting kindergarten. Like every other parent who has gone through this and will go through it in the future, life is just happening too fast. The kids are so excited to start at their respective schools, meet new friends and teachers, play and learn all day long. But you know what I am most excited about, school lunch. Yep, I have thoroughly enjoyed shopping for all of the fun food to pack in the kids lunches, letting AJ pick out what he would like to eat and planning on what to fill their little bellies so that they will be at their very best for the school day. Hopefully the task will still be as appealing a couple of months into the school year, because we are at the beginning of this game. It is a fun challenge to figure out that fine balance between what they will definitely eat and what is yummy and good for them. The plan is to utilize some prepackaged “kid” food along with fresher foods and beverages, cover most if not all of the food groups and make sure they are getting enough protein, carbohydrates and healthy fats. So today when I let AJ choose what he wanted in his very first kindergarten lunch, he more than eagerly started rattling off a list of his favorites to but in his brand new shiny lunch box (there is NO question whose child he is). He selected whole wheat crackers, natural peanut butter to dip them in, two Baby Bell mozzarella cheese rounds, two clementines, water and a juice box. There is just something so appealing to kids about miniature foods that seem to be just their size. We talked about washing our hands before we eat, his ability to open any of the packages on his own (and in retrospect, we should of discussed not sharing- in case of allergies). All in all, I think he is more than prepared for a successful first big kid lunch in a real school cafeteria. Let’s just hope he eats it.